Jayhawks center Udoka Azubuike (middle) rips a rebound away from Volunteers forward Grant Williams (left). Azubuike would later foul out of the game. NEW YORK — Dedric Lawson had 24 points, 13 rebounds and five assists, and No. 2 Kansas rallied to beat No. 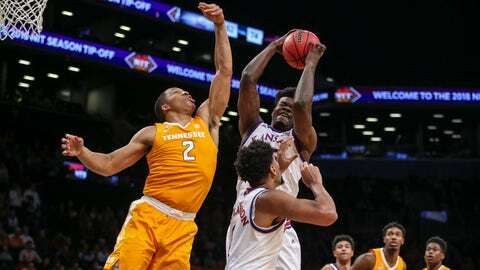 5 Tennessee 87-81 in overtime early Saturday morning in the NIT Season Tip-Off title game. Kansas’ Charlie Moore tied the game at 69 on a pair of free throws with 1:24 remaining. It would go to overtime that way after a couple defensive stands by Tennessee in the waning seconds.ck.